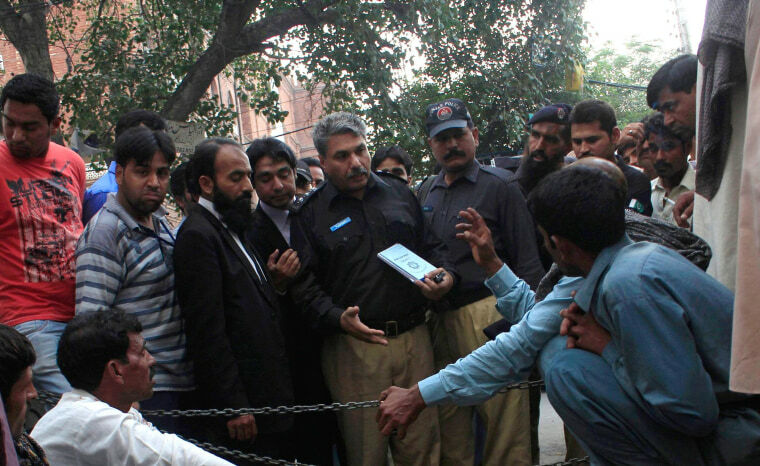 LAHORE, Pakistan - A 25-year-old woman was stoned to death by her family outside one of Pakistan's top courts on Tuesday in a so-called "honor" killing for marrying the man she loved, police said. Her father, two brothers and former fiance were among the attackers, he said. Iqbal suffered severe head injuries and was pronounced dead in the hospital, police said. All the suspects except her father escaped. He admitted killing his daughter, Cheema said, and explained it was a matter of honor. Many Pakistani families think a woman marrying her own choice of man brings dishonor on the family. Iqbal had been engaged to her cousin but married another man, Cheema said. Her family registered a kidnapping case against him but Iqbal had come to court to argue that she had married of her own free will, he said. Around 1,000 Pakistani women are killed every year by their families in honor killings, according to Pakistani rights group the Aurat Foundation. The true figure is probably many times higher since the Aurat Foundation only compiles figures from newspaper reports. The government does not compile national statistics. Campaigners say few cases come to court, and those that do can take years to be heard. No one tracks how many cases are successfully prosecuted. Even those that do result in a conviction may end with the killers walking free. Pakistani law allows a victim's family to forgive their killer. But in honour killings, most of the time the women's killers are her family, said Wasim Wagha of the Aurat Foundation. The law allows them to nominate someone to do the murder, then forgive him. "This is a huge flaw in the law," he said. "We are really struggling on this issue."